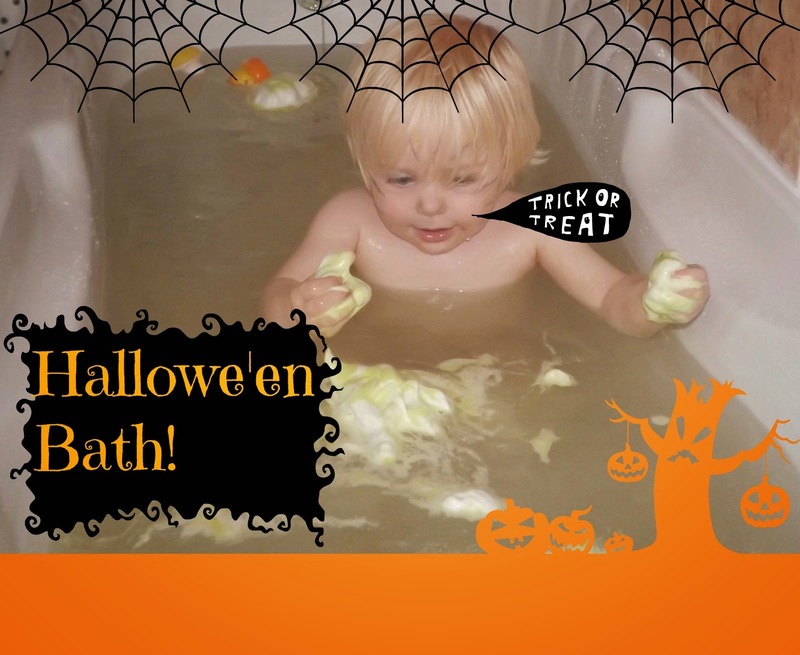 Toddler Hallowe'en: A Spooky Sensory Hallowe'en Bath! With Hallowe'en on the approach, I have set my sights on starting a whole host of spooooooky activities to keep Tyne and myself occupied as the dark nights draw in! I must admit, up until now I have done very little nothing in the way of sensory activities, craft or baking with Tyne .... considering my back ground as a nursery nurse this is rather appalling, as I have folder upon folder FILLED with sensory play activities I created during my years working in nurseries and infant schools. I doubt that there is a single sensory play, craft or baking activity I haven't undertaken with other peoples children at work over the years....but now my own son is 18 months old and I haven't done a single one with him! I think it's simply that, having done it all before for as part of my job, I didn't find the thought of these various messy activities particularly exciting.....been there, done that!....but I decided all of a sudden to try out this spooky sensory bath time activity to see what Tyne would make of it all. 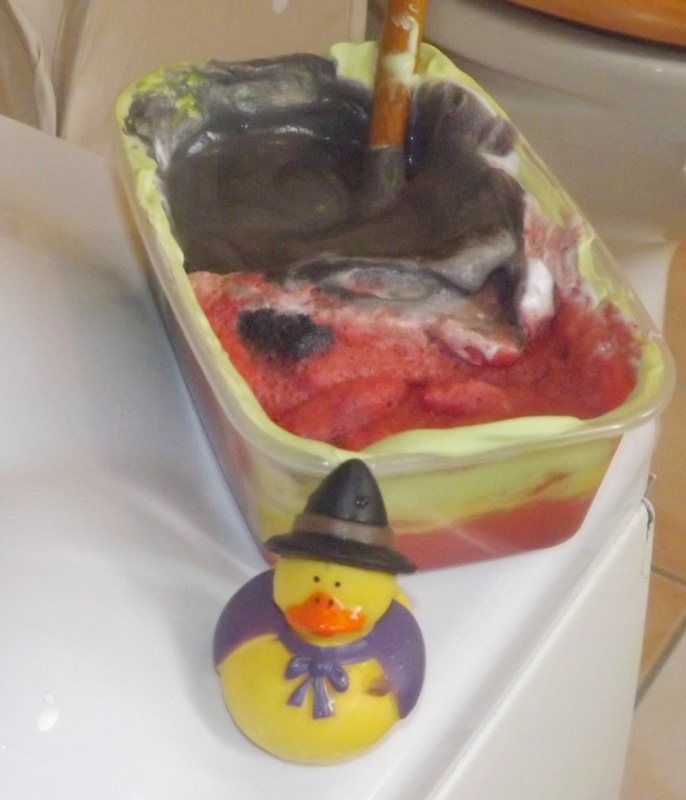 We were sent some absolutely adorable Hallowe'en themed rubber ducks from Baker Ross (£3.96 for a pack of 6), which were perfect for our Hallowe'en themed bath and were actually what gave me the idea in the first place! 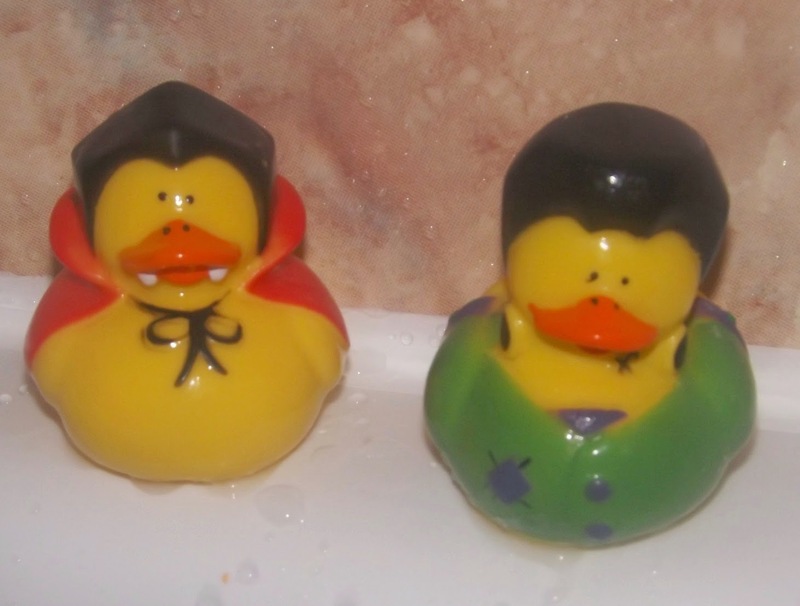 The set includes a Vampire duck, Frankensteins Monster duck, Witch duck, pumpkin duck, Mummy duck and Ghost duck! All much more cute than they are spooky so perfect for little ones! 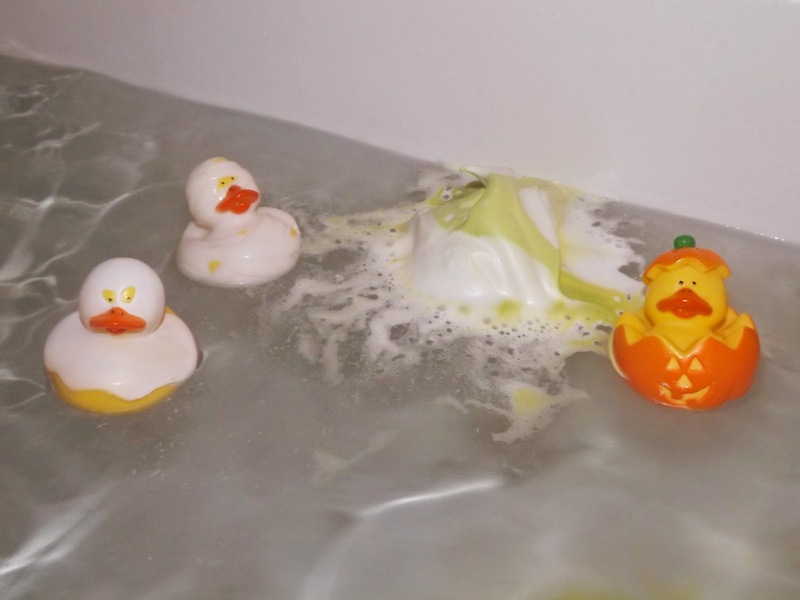 I dotted the ducks around and inside the bath tub to set the scene. I then squirted a few big dollops of shaving foam into the water and drizzled it with some green food colouring to make it more Hallowe'en-y. 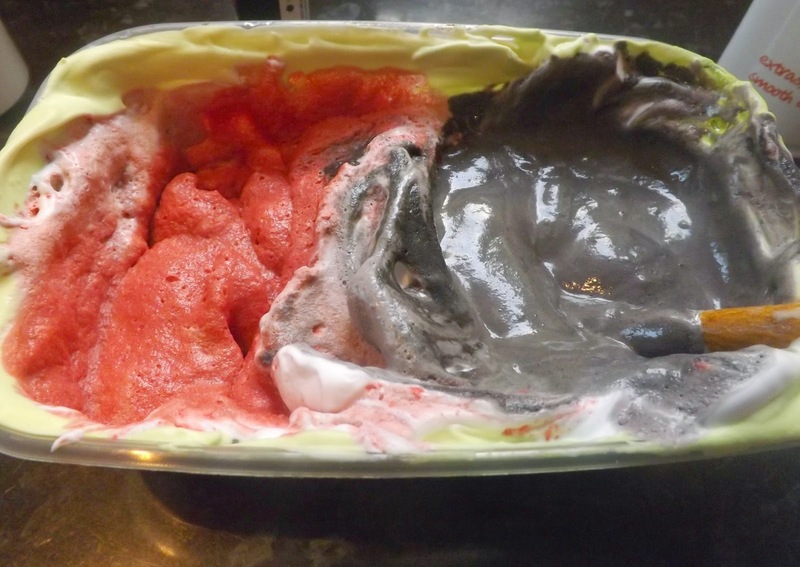 And finally, I filled a plastic tub with more shaving foam, and mixed one side with black food dye and the other side with red food dye....this created two shades of shaving foam "paint". I put a paintbrush in the paint tub, and placed it on the side of the bath....ready for Tyne to discover. Then I lit some candles around the bath room, and put Tyne into the tub - I sat back and let him discover everything at his own pace and let him decide what to do with everything. The first thing he did was splash around in the murky coloured water, dunking his hand underneath and bringing out again to check it was still there! Having never experienced darkly coloured water before, he was very intrigued by "Hiding" his hand inside the water. He then had a good look at all the ducks, and did the same thing with them....dunking them under and bringing them back out. Once he was bored with this, he moved on to the shaving foam in the bath. 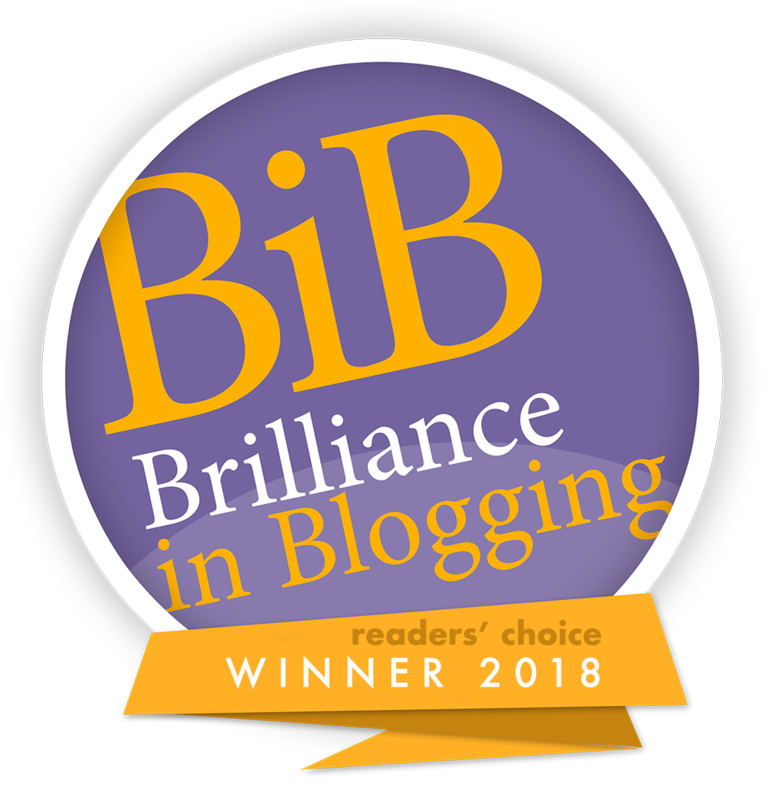 He grabbed handfuls of it, examined it carefully, squished it between his fingers, clapped his hands together to make it splash out, and rinsed it off by dipping his hands into the water. He enjoyed covering his hands in the green foam and lifting them to show me, too. He did this for a good few minutes. Then he noticed the paint tub, and dove straight in to investigate! He first decided he'd like to dunk some of his dunks in the paint...and then spend a few minutes washing the paint off them in the water. He then took the paintbrush and had a go at painting the ducks this way. Then he discovered he could paint on the side of the bath! And this is where he found the most fun part! He loved painting big long black strokes on the bath, and once I said "Clever boy, you're painting! "...he had a new word down! He repeatedly shouted "Paint! Tyne Paint!" for the remainder of bath time! 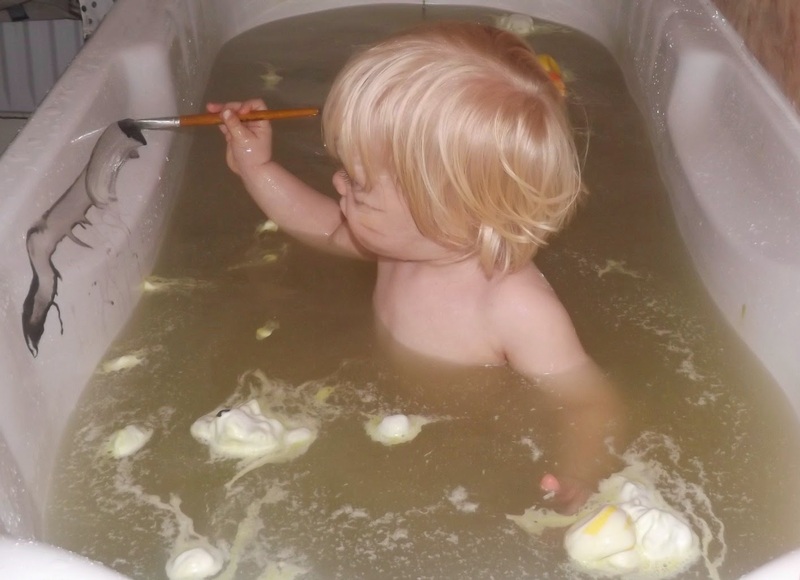 He continued to paint on the side of the bath for around 15 minutes. He kept asking for "more paint"...which I did give to him a few times...but once the water started to get cold, it was time to get out. Tyne kept hold of the paint brush and carried it around with him for the rest of the evening, saying "Paint!" over and over again. Once Hallowe'en is over, we will continue to use shaving foam paints in the bath using lighter colours....just as nice to paint with but not leaving the water so murky! As for the bath and the ducks, again a quick rinse with the shower and they were just as before....there was no staining whatsoever. I'm glad to have finally made a start on some sensory play activities with Tyne and having seen how much he's enjoyed it, I will be sure to do more of it. 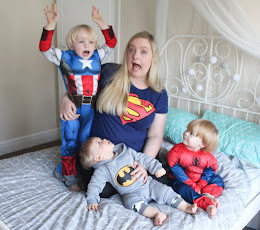 I would highly recommend bath time as a place to start if you are new to messy play, as it is the ideal contained space to allow a bit of mess and super-easy to clean afterwards!